I have a goal. This goal is to create some more trails in my local neighborhood at an undisclosed location. I have not purchased any IMBA books, or paid for any plans/schematics in order to have the least amount of environmental impact to the area. This trail will also have $0.00 invested into it. Doesn’t sound too promising does it? What these contingencies have left me with is to follow deer trail, and old wagon paths in order to make the building easy as possible. The entrance into the new trail is connected to the old area of trail by a deer path that goes across a piece of land that is seasonally marshy. If this trail is to ever prosper, It needs to be accessable all year round. I quite some time taking some spare treated wood from the garage to make some pallet-esque platforms for people to traverse the muddy areas. The amount of time it took to make these platforms, move them into the woods, and put them into place was ridiculous. I think for twelve feet of platform, from concept to installation, took five hours. FIVE HOURS FOR TWELVE FEET. Did I tell you I need about 40-50 feet of clearance over this muddy area? Not only is this a problem, but further along the trail, there are several fallen trees 10-14 cm in diameter that just need to be taken out-of-the-way in order to have an enjoyable path. Solution: Corduroy Paths – Yes, I have taken a chainsaw into the woods to clear fallen trees, and I’m placing these lobs in the marsh. This method is still a ton of work, but it is a lot faster, and a lot cheaper than building platforms out of lumber. I’m sure if there were mountain bikers that saw me doing all of this, they would think I was crazy, trudging through the mud and placing logs all over the marsh. The crazy thing is that there is no immediate reward to all of this. The amount of work needed is still immense, and difficult. It is to the point where power tools are required to be lugged into the woods, and lots of carrying debris to free up space. It does end up with me sleeping very well at night. Yesterday, I went out into the woods at 8:00 AM, and by noon, my back hurt like a farm boy bailing hay or some kind of equivalent labor all day. For those people who have built trails by yourself, what are your opinions and tips? How do you create paths to cross marsh? What about clearing leaves? Do you make the trail well visible? Should I weed-whack the little growth along this new trail? How long on average will a singletrack trail last before maintenance is needed? I’m learning a lot as I go, but advice never hurts. Okay guys, here is a boatload of footage (Almost the whole thing) of Thad’s Singletrack (Race to Lil Moe’s); I apologize for not filming in a resolution higher than 480p, but that alone was 3gb! The other two riders you see in the video are Amanda-Lynn Warner; a WVWC senior, and Barry Phillips, a local resident and fantastic rider/retro-dude. Wow, eleven videos, 60 minutes of footage; did anyone watch them all? What’d ‘ya think? Comment below! Watters Smith State Park is What??? Watters Smith State Park is What? It’s freakin’ awesome. That’s what it is. Somehow on 0.78sq miles of land, they were capable of reserving everything from the bunny trails of hiking/biking all the way to some downhill that I would really suggest having dual suspension for. This park really runs the whole gamut of fun. 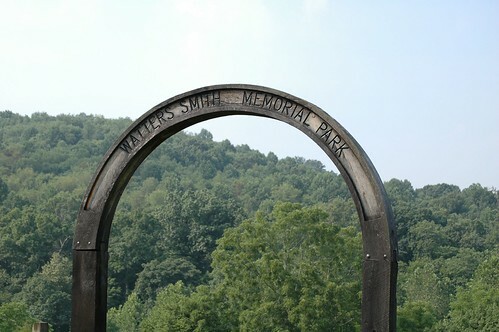 It is kind of hard to describe Watters Smith without making it sound confusing… There are so many loop-arounds and back ways to get to all the locations and trails around the park that you never really are in a place that will not get you to where you want to go. There is an abundance of parking, and if you get there during typical business hours, you may be able to pick up one of their hiking/biking trail maps.